ne of the profit centers of the U.S. Mint is the sale of proof sets. Starting as early as 1856, the Philadelphia Mint manufactured special, highly polished specimen coins for selected collectors. In many cases, as few as 20 or 30 such coins were made in each denomination. The method was basically to polish, by various means, the planchets  the blank discs from which coins are struck  and strike them with dies that have also been highly polished. The net result is a coin with a mirrored surface, and usually with sharp edges. "Modern" proof coinage starts with the issues of 1936. The Mint sold these coins in sets of five, and over the counter individually. Since the collector demand was quite small and the coins were sold at a premium ($1.89), only 3,837 sets were sold in 1936. Single coins could be purchased for 15 cents above face value. Each coin was wrapped in a square of paper, not unlike toilet paper. In 1940 my father took me on a trip to Philadelphia to visit the Mint. While there, I inquired if could buy proof one-cent coins. The clerk asked me, "Which dates do you want?" I replied, "What dates have you got?" She said, "1937 to 1940; we have sold out of the 1936 cents,"
The price was 16 cents per coin. I bought one of each and put them away  for the next 20 years. As collector interest picked up, the Mint produced more proof sets each year, although no proof coins were minted from 1943 through 1949. The Mint resumed proof set production in 1950 and packaged the sets in little pliofilm baggies stapled together and packed in a small square box with tissue paper. These are known as "boxed" sets. Since the sets do not hold up well in these boxes, most have been removed and placed in custom plastic holders. By early 1955 the boxed set was declared to be unsatisfactory for proof coins, and the Mint developed a flat, sealed pliofilm packet for the coins and the U.S. Mint seal in foil. Sandwiched between two pieces of cardboard and sealed in manila envelopes, these "flat packs" were sold for $2.10 per set. This type of packaging lasted through 1964. Again, the packaging had proved unsatisfactory for long-term storage, as many of the sharp edges cut into the pliofilm and, as a result, the coins developed spotting and tarnish. The Mint suspended proof set production for three years, 1965-1967. When the next generation of proof set packaging came out in 1968, the pliofilm was replaced by a hard plastic case with a color insert. Because of the popularity of the 1964 proof set with the new Kennedy half dollar, Mint sales soared to almost four million sets. The new 1968 sets were minted in San Francisco, and each of the five coins bore an "S" mint mark. The retail price from the Mint rose to $5 a set. In 1973 the price rose to $7. Proof set production has hovered between 2.5 million and 4 million sets each year since then, and prices have varied depending on the number of coins offered in each set. Starting in 1983 the "Prestige" proof set was issued alongside the regular five coin set. Issued in much smaller numbers (140,000) and including an Olympic commemorative silver dollar, the issue price in 1983 was $59. 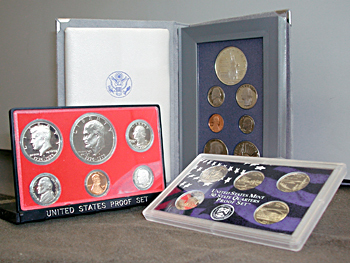 Each year through 1997, the Mint offered a Prestige set that included a commemorative silver dollar of that year. The usual mintage of such sets was in the 200,000 range. A special feature of proof coins starting in the 1960s was "cameo" or "deep cameo." This feature is usually limited to the first few hundred proofs struck from dies where the relief features are not polished but sandblasted to created a cameo effect. Once the coins are minted, the relief features eventually get polished down and the remained of the production are normal-looking proof coins. For some of these cameo or deep cameo coins, so few are known that they command extraordinary prices at auction. Today, nearly all the production sold to the public consists of cameo and deep cameo coins, as many more dies are used in the production of proofs. To tell if a coin is a proof, simply look at it and compare it to the shiniest coin in your pocket. Proof coins are either encased in plastic sets or in single-coin holders; they do not usually circulate (although now and then, someone accidentally spends one). Ask any coin dealer to show you a proof set. One look and you will see the difference. Since the 50-States Quarters Program began in 1999, the Mint has been issuing two types of proof sets each year with five quarters. One set is struck in a copper-nickel alloy and the other in .900-fine silver. The Mint sells the copper-nickel sets for $13.95 and the silver sets for $31.95. To get on the Mint's mailing list  so you can order proof sets directly from the manufacturer each year  write to The U.S. Mint, Customer Service Center, 10003 Derekwood Lane, Lanham, MD 20706, or sign up online at www.usmint.gov.